In any facility the water flowing to your crops is inarguably the life blood of the operation. The most important factors in the ability of your water to effectively provide nutrients to plants are pH and Alkalinity. Hanna produces the most advanced pH control and Fertigation systems on the market that will precisely adjust the pH and alkalinity of your irrigation water “in-tank” or “in-line” over a vast flow range. This guarantees optimal growth, maximized yields and efficient use of nutrients eliminating waste. Alkalinity represents the buffering capacity of water or in simpler terms, the ability of water to neutralize an acid. The higher the alkalinity, the more resistant water will be to pH change and more acid will be required to reduce the total alkalinity and lower the pH. Alkalinity is comprised of bicarbonates, carbonates, and hydroxides combined with calcium, magnesium, or sodium. Alkalinity is expressed as ppm calcium carbonate equivalent and a high ppm (CaCO3) concentration indicates that more of these components are present in the water. The pH typically rises as concentration increases but depending on the makeup and ratios of the constituents, the pH may vary between 2 samples from different sources with basically the same alkalinity. So, it is important to know not only the pH of your water but, the alkalinity as well to ensure optimal nutrient uptake and plant health. As previously stated, as alkalinity increases, pH may increase in the water stream and in the growing media. It is possible that a very small change in pH is reflected by an increase in alkalinity. As alkalinity increases, availability of certain plant nutrients, particularly the micronutrients like iron and manganese are negatively affected resulting in deficiencies. So, it is vital that alkalinity testing is performed along with pH to best determine the condition of your water. In many cases it is necessary to inject acid (sulfuric or phosphoric) into the water or to use “acid-forming” fertilizers. The most commonly used, readily available, and least expensive is sulfuric acid. The amount of acid to inject should be determined based on your alkalinity value and ultimately the optimal alkalinity target you wish to achieve. Once you have achieved your desired alkalinity level (ppm CaCO3) as a result of acidification, note the pH and use that value as your pH target to drive your acid injection systems. It is important to note that simply setting your pH target to 5.8 or 6.0 without knowing your alkalinity value may not leave you with optimal alkalinity for nutrient absorption. You may actually find, in some cases, the alkalinity of your water may be below minimal levels at a pH of 6.0 and optimal alkalinity may be found at a higher pH such as 6.2 to 6.4. 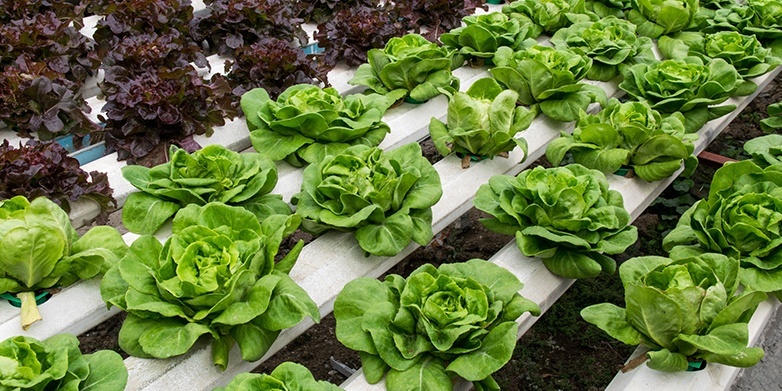 Many growers in the Hydroponics industry use RO systems to purify their incoming water supply. RO systems are highly effective at removing almost everything from water, passing essentially pure H2O. As a result of CO2 exposure during the filtration process, carbonic acid is formed leaving the water hovering in the 5 to 6 pH range. In 90% of applications a pH of 5.7 to 6.0 is considered optimal for most species of plants. Perfect, right? However, the alkalinity of the RO water at this point is virtually 0 ppm. Exposing plants to water with this almost non-existent level of alkalinity can be catastrophic. The water will leach away essential ions and basically corrode the root system as it would copper piping, but much faster. In addition, certain nutrients and bound compounds in the growing media may become available in toxic amounts. Extremely low alkalinities lack vital elements such as calcium, magnesium, and sulfates which are also very important to plant health. Hopefully there are no experienced growers that would expose their plants and/or grow media to pure RO water under normal conditions for any considerable amount of time. However, this is a very good example of how it is vital to understand not only the pH value of your water but the Alkalinity as well. Another consideration is pH control. Water with very low alkalinity is almost uncontrollable from a pH perspective. Growers, looking solely at the pH value of RO filtered water, have asked if it is possible to inject acid to lower the pH of the water from 6.2 to 5.8. Now that we understand the important role of alkalinity, lowering the pH in this particular case seems absurd at first. However, if you are looking at just the pH value you can see how this is not an unusual expectation. As previously stated, alkalinity represents the buffering capacity of water, meaning that it “resists change”. In a practical sense, alkalinity creates a “push back” against what is added to it, such as an acid. Without alkalinity the water pH would plummet when adding a small volume of acid and this would make pH control virtually impossible even for the most advanced systems. Again, by understanding the alkalinity, the grower would realize that adding an acid in this particular scenario is completely unnecessary. When you are using RO water, a fertilizer program that alternates a potentially basic fertilizer containing calcium and magnesium with a low potential acidity fertilizer can help prevent pH crashes in the growing media. This also can supply much needed nutrients. Acids have been and always will be an excellent tool for growers to exert better control of irrigation water alkalinity (mostly bicarbonates and carbonates) and growing media pH. Once the role of alkalinity is understood, the grower may consider the following practical step to control alkalinity using acids through an injector system. 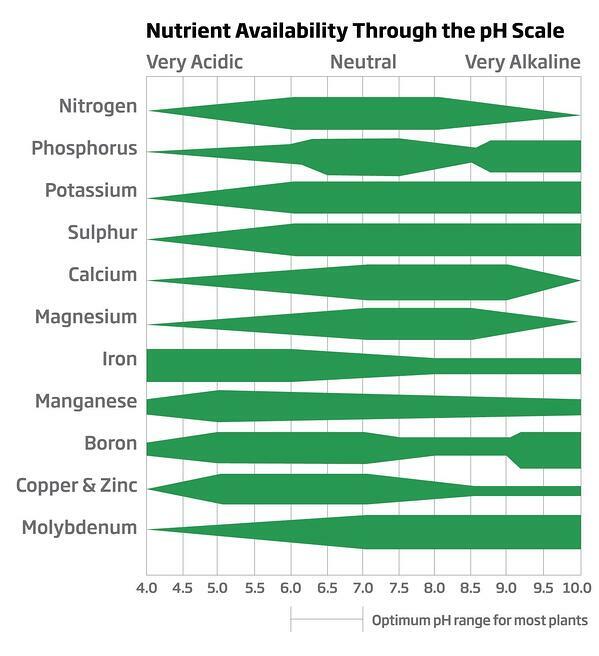 Please see the chart below from an article written in Garden and Greenhouse Magazine, it illustrates the optimal pH range where most commercially produced crops will absorb nutrients. The acids commonly available to growers include phosphoric, sulfuric, nitric, and citric. 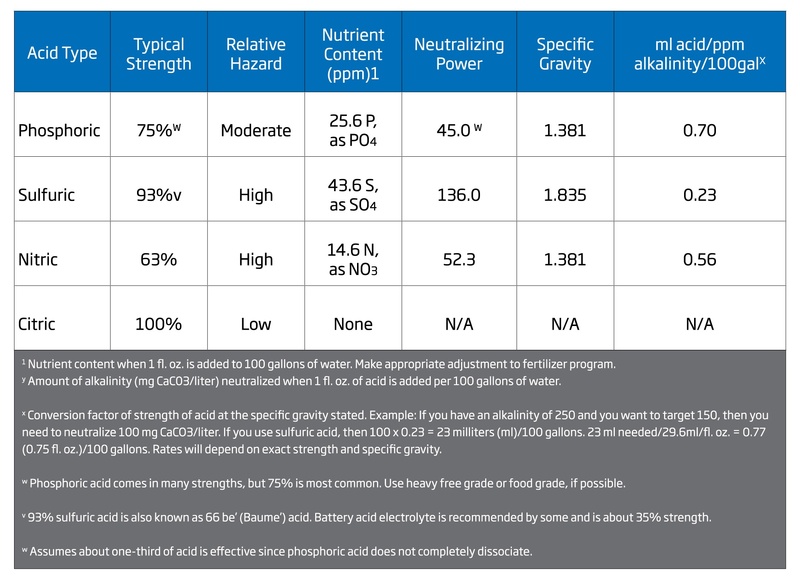 The table below from UMass Amherst, the Center for Agriculture, Food, and the Environment, lists criteria for choosing the right acid: relative safety, neutralizing power, cost, and nutrient content. The most effective and widely used acid is Sulfuric Acid; however, this is one of the most hazardous acids to use. For low amounts of alkalinity removal, Phosphoric Acid may be the acid of choice. However, care must be taken when using this acid because Phosphorus levels will increase. Nitric Acid is theoretically ideal because it adds nitrate nitrogen; but it fumes and is highly oxidizing, making it very difficult to handle. Citric Acid is a weak organic acid and a solid, making it safer than the other three; but it is much less effective, and therefore more expensive to use. Once you choose an acid, make sure your injector can handle the task. Not only is it important that the materials be acid resistant, the controller must be able to accurately control and maintain a fixed pH over a wide flow range. When properly automated with Hanna pH control and Fertigation Systems, Commercial Greenhouses, Hydroponics Operations, Grow Rooms, Living Walls, and Vertical Farming Facilities can create an environment where the nutritional uptake of the root system is always maximized. Automating this process will create reliable precision and accuracy, reduce fertilizer and labor costs, increase crop yields and plant health, and provide a safe work environment for staff. HIACID is a standalone pH control system that can accommodate small and large facilities using any commercially available acid. HI10000 can accommodate facilities with flow rates from 5 GPM to 750 GPM. The HI5000 and HI2500 are available for growers with smaller operations. 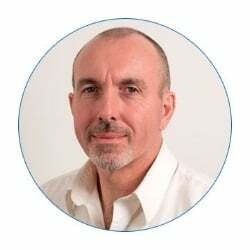 This level of flexibility coupled with remote access can provide quality of life benefits to the grower and staff, allowing the entire pH and Fertigation process to be monitored and controlled from anywhere in the world. The Hanna HI10000 Fertilizer Injection System precisely monitors and controls pH (acid injection) and fertilizer concentrations for all types of hydroponics, greenhouse and field agricultural applications. The HI10000 is also a complete Irrigation Control System with 32 valve (zone) capability. 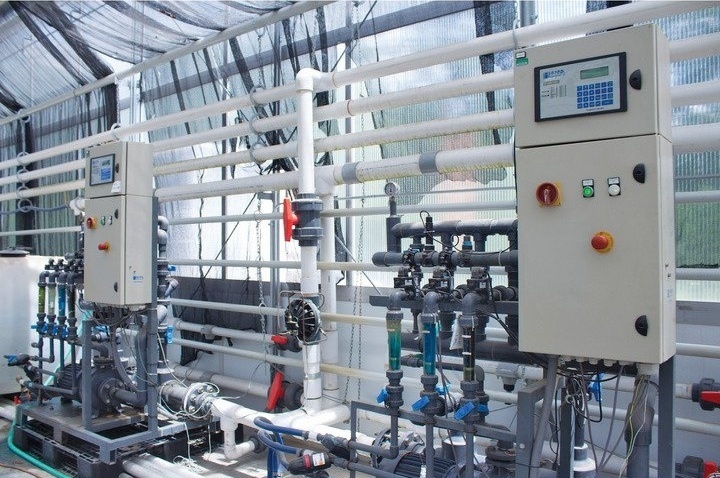 Unlike flow-driven systems of the past, the Hanna Fertigation System continuously measures the actual pH of the flow-through, and precisely adjusts the concentration of acid (or base) into the system using an advanced hybrid flow/pH control technique. Acid injection control can be incredibly difficult and is not linear so we at Hanna developed a system that not only paces the injector based on the flow rate, but also monitors the pH and adds additional adjustments based on the changing pH of the water. With both parameters covered, the Hanna pH Control System can safely inject up to 93% Sulfuric Acid and accurately maintain the pH setpoint over a wide flow range. Hanna Instruments is the leading manufacturer of affordable instrumentation specifically designed for the Greenhouse and Agricultural industry. In addition to providing Growers the highest quality products for almost 40 years, we at Hanna deliver unmatched after sales technical support and service and we will work with you from product selection to final installation and training. Our goal is to continue to bring you the highest quality products as well as continual service and support ensuring you the best results, saving time and money.